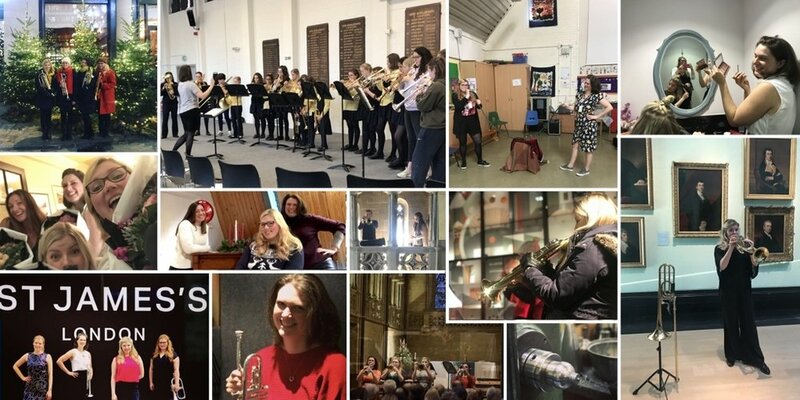 Bella Tromba have been invited by the Royal Opera House to perform two fun packed concerts at Covent Garden on Sunday 17 March. Featuring Handel’s iconic Water Musicon a hosepipe, fanfares and flourishes by Monteverdi and a rip-roaring folk song selection arranged by the inimitable Becca Toft, Bella Tromba is set to deliver a fun-packed event. Performances take place at 11.15am and 13.45pm and are suitable for all ages but aimed particularly at children aged 3-10 years. Book a ticket in advance to reserve your place. Have you been asked to play a fanfare trumpet for the very first time or are you just curious about what one is? Our five intriguing facts will give you an insight into the brass familie’s most majestic instrument. Famously found in the tomb of King Tutankhamun’s tomb in 1324BC, the trumpet in the form of a resonating tube is justifiably called ‘ancient’, however the modern day valved fanfare trumpets favoured by todays military are much newer. Between 1938 and 1959 London based Boosey and Hawkes made 492 three valved instruments known as Coronation Trumpets after the recent coronation of King George VI. The addition of three valves allowed players to achieve all the notes of the chromatic scale unlike the earlier instruments. 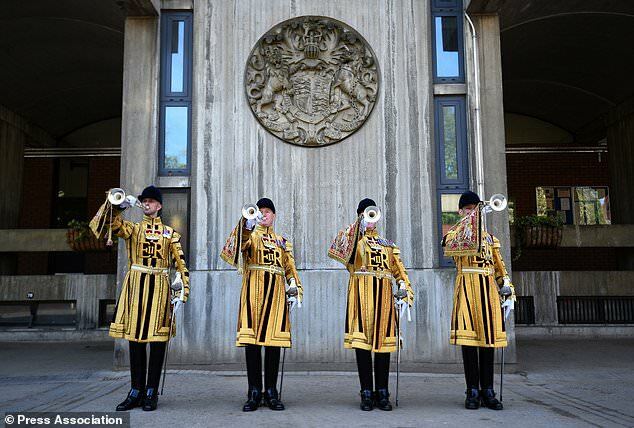 The older valveless trumpets are still played, most famously by the State Trumpeters of the Household Cavalry. Unlike a coiled up trumpet or cornet, the resonance on a fanfare trumpet is largely uninterrupted as the vibration travels down a long straight tube. After all, these instruments are designed to signal the arrival of very important people so they need to be heard! A word of warning, if you are playing a fanfare trumpet for the first time it might feel quieter to you as the sound is coming out a metre away from you but trust me, that is an illusion. There is a reason this conductor is standing so far away…. use a lyre for your music, there might not be enough room for you and your trumpet let alone a music stand! The weight on a fanfare trumpet is spread across the length of the instrument so the pivot point feels a long way from your face. Stand with your feet firmly planted hip distance apart. Find a good grip for your hands and don’t be afraid to put the instrument down during rehearsals and stretch to release muscle tension. It takes time to get used to the feel of any new instrument. A ceremonial banner will add more weight, especially if you are standing in a windy spot! Set in Ancient Egypt, Verdi’s grand opera Aida was all set to include a replica of the actual trumpets found in the ancient tomb of Kings Tutankhamun. It wasn’t to be, Verdi declared the sound too soft and in the wrong key. Instead he tasked instrument makers to create a longer instrument with one valve to allow him to include a full arpeggio in his composition. Today these specialist instruments are still commissioned by opera houses to recreate the grandeur Verdi envisaged. Plus, accessories are all the rage and a hand stitched or custom printed banner of your choosing could mark you out from the crowd whose attention you will shortly be monopolising. Happy days! Well, first let’s start by saying a very Happy New Year to you and then a big thank you to everyone who has turned out to watch the quartet play on our Christmas tour. We love nothing better then to play together but it’s the joy of seeing an audience smiling that makes our night. 2017 was a lot of fun and I hope you enjoy our round up below. We are kicking off 2018 with a return visit to the National Portrait Gallery and it would be great to see you there. Playing King’s Hunt at Brockenhurst Primary School was terrific fun! Spending the day with the fantastic young players at South Hampstead High School. Being dressed by Jigsaw for the opening of St James’s Market, London Enjoying each other’s company so much we forget we do this for a living! Peter Longworth’s energy as a young, keen composer first compelled the quartet to listen to his music. A recommendation from his composition teacher at the Guildhall School of Music that his was ‘a name to watch’ cemented the quartet’s determination to persuade Peter to write his first trumpet quartet. Peter was still young enough to be playing trumpet in the National Youth Orchestra of Scotland at the time and Jo and Peter spent some time together in practice rooms trying out mutes and sound effects that fed into his first trumpet quartet, Colori di Roma. A few years on and Peter Longworth is now recognised as an accomplished composer whose works have been played by members of the London Philharmonic Orchestra and the London Mozart Players. Peter will be the first reciprocate of Bella Tromba’s Young Composers Fund. Jo caught up with him to find out where his musical inspiration comes from and what his intentions are for his second trumpet quartet. The title of your second trumpet quartet is ‘Days of Bells and Flying Creatures’. To me that seems to set a scene. Romantic works such as Debussy’s Le Mer could be characterised as programmatic. Is that how you see your music? Does it tell a story? Rather than telling specific stories in my music I sometimes try to evoke the atmosphere of a particular place or – to use your words – ‘set a scene’. Days of Bells and Flying Creatures is concerned mainly with sounds heard throughout the course of a day in Tuscany and I think these sounds are in themselves evocative of different settings: a church; a country lane; a farmyard. I think being a composer must be a wonderful state of being. Do you walk around with a blank book of manuscript capturing sounds you hear or do you dream melodies? Where on earth do you find all your ideas? I work both at home and in a cafe near where I live, and I’ll often think a lot about the piece I’m writing whilst walking between the two. Of course, as is bound to happen, external sounds can interrupt your thought procesess when you are walking, but this isn’t necessarily a bad thing as these sounds can spark new ideas. With Days of Bells and Flying Creatures I recorded the sounds that surrounded me on a daily basis during a residency in Italy – tolling bells; birdsong; the buzzing of insects – before transcribing them and making them the basis of the piece. As for your question about dreaming music, yes, that does indeed happen from time to time! It’s wonderful that you like to work closely with the performers that you are writing for. How does it feel hearing your piece come alive during rehearsals? Is it very different to just hearing the final result at the premiere performance? Premieres are fun – if slightly nerve-wracking – occasions, but I probably enjoy the rehearsal process most of all. Being with performers as they discover a new piece can be a magical feeling and, interestingly, I find that I learn new things about my own work when hearing it rehearsed in detail. From a practical point of view, working closely with musicians also makes it much easier to discuss how the music might be interpreted and these conversations can make a real difference to the final performance. How do you approach writing for brass instruments? Does it feel very different to writing for strings or wind? One of the things that I love about being a composer is the challenge of writing for different types and combinations of instruments, and often the natural properties of a group of instruments will shape the kind of music that I write for them. As a trumpeter myself I feel rather at home when writing for brass, but it is important to keep an open mind and not get too comfortable. For example, when composing this particular piece I wrote down some ideas that I later realised would be better suited to a piece for string orchestra that I have to write! Have you written for the bass trumpet before? No, this was my first experience of composing for the bass trumpet, but I certainly hope that it won’t be my last! It’s a wonderfully expressive instrument with a rich sound and I have written plenty of melodic lines for it to play in this piece. You explored the different sounds created by mutes in your first trumpet quartet Colori di Roma. Will you use mutes for ‘Days of Bells and Flying Creatures’? Absolutely. I love the range of timbral possibilities that mutes can offer and in ‘Days of Bells and Flying Creatures’ I’ve used various types of mutes in different combinations to capture the ringing of bells, as well as to mimic the flying creatures of the title! I like to think that I’m still a young composer myself, but I think it is important for a composer to be able to put himself or herself in the shoes of a performer, and a good way of doing this is by playing an instrument, and – if at all possible – playing in an ensemble (something I’ve just started to do again after a few years).